Hey parents! 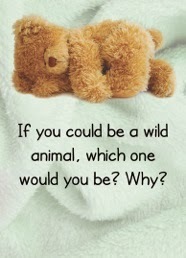 Want to end the day on a happy note with your youngster? Want to turn bedtime routines into memory-making moments? Tuck-Me-In will help you accomplish that goal. Each box contains 90 questions to stimulate your child’s imagination and generate conversation. Keep the box near his bed and ask him to select one card at bedtime. Read it together, and then listen to your child’s response. You’ll share a few laughs. You’ll gain insights into your child’s mind. And you’ll build a loving bond with your precious little person. 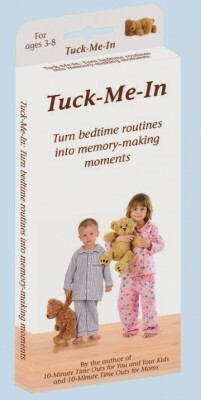 Tuck-Me-In is an ideal resource for parents, grandparents, teachers, and care providers. For use with youngsters age 3-8. Thanks for the cards! I’ve been going through them with my four-year-old daughter and am often blown away by her imagination, answers, and what was important to her that day.